I wanted to address something before going into detail about the LSU-Auburn game. I saw some Auburn fans were incensed about the pass interference (PI) calls during the game; but honestly, the referees didn’t even call all of them. They also apparently had double standards (in Auburn’s favor) about what constitutes a taunting. The referees missed some holding calls too (probably on both sides), but no officiating staff can call every hold. The ones they did call were obvious, but I’m sure some Auburn fans complained about those too. In the less egregious of the two PIs that were called on the final drive, the defender grabbed the receiver’s elbow before the ball arrived. It wasn’t one of those hand-check PI calls: it hindered the receiver’s ability to catch the ball. The receiver wasn’t tackled or anything, and defenders can get away with worse at times; but there are few if any officials who would have seen that play well and not called it. Earlier in the game, there was another PI call that was borderline uncatchable, but it has to be clearly uncatchable to overrule an interference. The interference took place right as the ball was being released, so it was very hard to say where the receiver would have ended up had the interference (it may have even been holding) not occurred. I know coaches are careful to avoid saying anything that may result in a fine, but both head coach Gus Malzahn and defensive coordinator Kevin Steele (formerly LSU’s defensive coordinator) deserve credit for properly placing the blame on the way the plays were called and executed. I agree with them that the important thing is LSU made plays with the game on the line and Auburn didn’t. The only thing I would quibble with is Steele blamed the coverage on the 71-yard touchdown play. Someone may have been a yard out of place; but I think it was mostly just a good offensive play, and no one could catch Derrick Dillon. He had four players right near him when he caught the ball, so the coverage couldn’t have been that bad. He and LSU quarterback Joe Burrow just saw and succeeded at hitting the small space on the field the defense left open. The whole field can’t be covered at all times, especially with LSU running or throwing very short passes on first down most of the time. 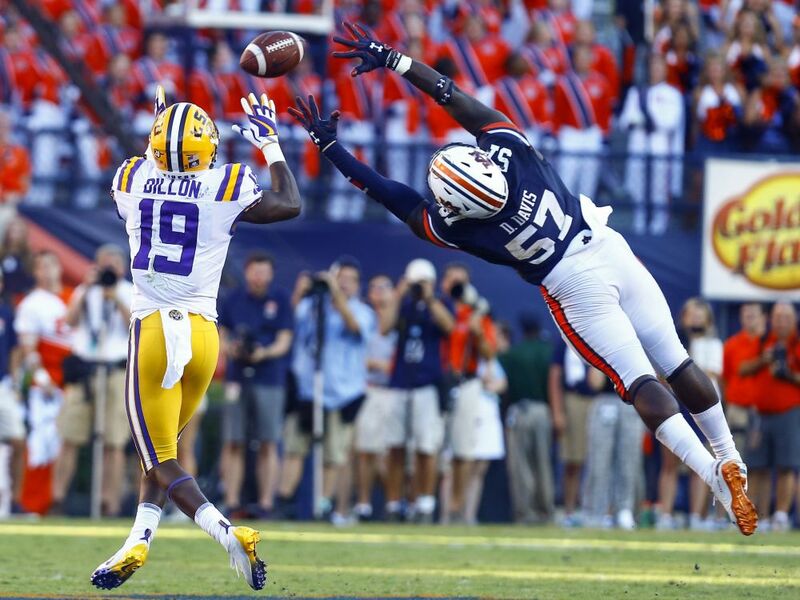 LSU WR Derrick Dillon catches a touchdown pass (what would be a touchdown pass after a sprint to the end zone anyway) over the outstretched arms of Auburn LB Deshaun Davis in the fourth quarter on Saturday in Auburn. It’s been since the mid-1990s (that’s before Saban arrived in Baton Rouge) that either LSU or Auburn beat a team that would finish with a winning record in a road game in this series. LSU won such a game in 1995, and Auburn won one in 1997. When Auburn won in 1999 and when LSU won in 2008 and 2012, the wins came against teams that would finish with losing records and fired head coaches. So in all likelihood, this is one of the best teams to lose at home in the history of the series. Another historical note: this was the first time since 1993 that LSU won on the road with the other team favored by 10 points or more. That was up the road in Tuscaloosa when a Tiger team that would finish with a losing record (one of six consecutive LSU teams to do so) beat the defending national champions, who had not lost a game in almost 26 months. I know coaches take things one game at a time, but I don’t have to. I’m not going to pretend to take Louisiana Tech just as seriously as Auburn, so before talking about the next opponent in detail, I wanted to talk more about what I’m looking forward to the rest of the season as a whole. As I said in the last blog, I’m not convinced that LSU is all of a sudden a title contender, even for the SEC title, but I’m confident that the Tigers will return to a bowl game with a winning record already secured. Whether that will be 7 wins or 11 wins, I’m not quite sure. ESPN’s FPI gives LSU a 0.1% chance of winning all of its remaining games. I’m not sure it’s that low, but it’s low enough not to worry about right now. The Tigers are given a 0.7% chance of winning the conference. That’s about 142:1. I’m not rich, but I’d put down $100 right now if you give me those odds. Anyway, as to the number of wins, I like LSU’s chances at Arkansas and at home against Ole Miss, Louisiana Tech, and Rice. That’s how I get to 7. Even if we somehow lose one of those, I don’t think every other team (at Florida, Mississippi St., Georgia, Alabama, at Texas A&M) would beat us, so even falling to 7-5 (which would mean a 4-5 finish) probably won’t happen either. I believe there is value to using computer systems, but I think descriptive ones (where you just value results so far) are better than predictive ones (where you try to calculate odds of winning). Anyway, I think the FPI I mentioned isn’t giving LSU enough credit. It puts the Florida game as almost 50/50. I did think Florida was going to win that game going into the season, but I was worried about LSU’s inexperience. As I said in the last blog, the Auburn and U. Miami wins show that being young isn’t a huge problem even if those are the only really good wins away from home for the whole season. Florida’s 27-16 home loss to Kentucky shows their experience isn’t quite as helpful as I thought it might be. I’m not sure how the FPI works, but it doesn’t seem to take new information on board as well as it should. The FPI also gives Mississippi St. a 57.5% chance of winning at Tiger Stadium. I expect a tough game, but I really don’t see Mississippi St. on the road being tougher than Auburn at home. The Bulldogs did beat LSU easily last year, but I think that was an LSU team that clearly wasn’t ready for SEC play in a tough road environment. They weren’t even ready for a good Sun Belt opponent at home. We will learn more about Mississippi St. after the Bulldogs play Kentucky and Florida though. If Mississippi St. is being held against LSU because of last year, why isn’t last year being held against Texas A&M? The Aggies haven’t beaten LSU since the 1990s, and they’re given about a 63% chance of winning this year. A&M looked good against Clemson (in a loss); but Syracuse looked just as good against Clemson last year (actually better because they won), and where did that get the Orange? Obviously one game isn’t proof of how the whole season is going to go, or LSU’s two big wins are proof that the Tigers will win at least 10 games. There isn’t too much to say about Louisiana Tech, but I hope we take them seriously. There isn’t much difference between a team like that and a team like Troy. The Bulldogs don’t have as many key wins (last beating an SEC team, Ole Miss, in 2011, after beating Mississippi St. in 2008), but the Bulldogs have made bowl games for 4 consecutive years and qualified for them in 6 of 8 years. They’ve played the following Power-5 teams within one possession, all on the road: South Carolina (2017), Arkansas (2016), Kansas St. (2015), Kansas (2013), Mississippi St. (2011), and LSU (2009). The Bulldogs have also beaten Illinois twice over that span. In 2011, Tech narrowly lost the Pointsettia Bowl to TCU, which finished 11-2 that year. In 2007, Tech lost to Hawaii at home by a single point. That Hawaii team suffered its only loss for the season in the Sugar Bowl. 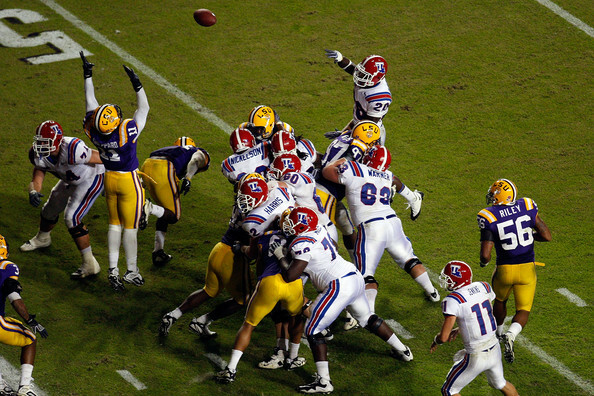 Louisiana Tech RB Daniel Porter throws a touchdown pass to give the Bulldogs a 13-10 lead as time expires in the second quarter in Baton Rouge in 2009. This is the first LSU-Louisiana Tech game since the 24-16 LSU win in 2009, which was only the third game in the series since the start of World War II. LSU is 18-1 all time with the only Tiger loss coming in 1904 (one of only five to be played in Ruston; there was one game on a neutral field). LSU has won by as much as 71, which they did in 1930. Since 1914, every game in the series (including this one) has been in Baton Rouge. Auburn, Cal, College Football, Fresno St., Kansas City Chiefs, Kansas St., LSU, New England Patriots, New York Jets, NFL, Notre Dame, Oklahoma, Pete Carroll, Pittsburgh, Texas, USC, Washington St. I watched the “30 for 30” about the USC “dynasty”. They won a lot of games in a row, but that’s not my definition of a dynasty. Overall, it wasn’t bad, but there were so many misleading or outright false things in there. That detracts from the quality and entertainment value. The first thing was the comparison between Paul Hackett and Pete Carroll. I wasn’t in the L.A. area at the time, so I don’t know know what the conventional wisdom was around here, but it just doesn’t match reality. Hackett’s previous head coaching job was with the Pittsburgh PANTHERS (not in the NFL like the documentary said). How is that like the New England Patriots at all? Hackett’s previous job was in the NFL, but offensive coordinator isn’t the same thing. The Chiefs did make the playoffs all but one year while Hackett was there, but after his first season, they failed to win any playoff games under head coach Marty Schottenheimer. The Jets never gave Carroll a chance and have been a poorly run organization for a long time, so I don’t blame him for their 6-10 mark in the one season he was there. Jimmy Johnson went 1-15 his first season with the Cowboys. Speaking of the Cowboys, Tom Landry went 0-11-1 in his first season there. It’s ridiculous to judge anything based on a head coach’s first year with no chance to follow up (Carroll didn’t do much better his first couple of years in Seattle either), so I’ll focus on his time in New England. Carroll coached the Patriots for three seasons and made the playoffs twice with an overall record of 28-23. He followed Bill Parcells, who had coached there for four seasons and also made the playoffs twice, going exactly .500 in his time there. I really don’t understand the view that Carroll was a failed NFL coach who was going to do poorly at USC; and as someone who followed the NFL closely in the 1990s, I did not have that expectation at all. I’m not saying I thought USC was going to be one of the top four teams seven years in a row though. I don’t think anyone could have reasonably expected that. We can also contrast Carroll’s prior NFL record with that of Bill Belichik, who coached a total of five seasons in the 1990s and only made the playoffs once with a total record with the Browns of 37-45. Next, they acted like USC looked so bad in early 2002 to for losing to Washington St. You have to hear the way they say it. 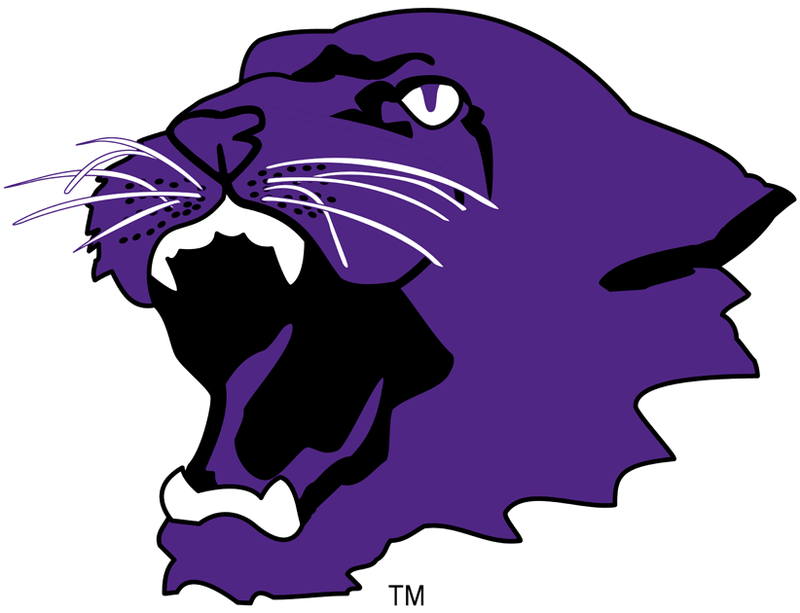 The tone suggested they had lost to a Cougar team from 2008-2010. The loss was in overtime in Pullman, and Wazzu had won 10 games the season before and went on to win 10 games again that season before losing in the Rose Bowl. 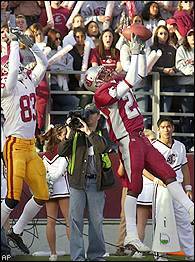 Washington St. completes a long pass against USC in October 2002. The Trojans won 46 of their next 47 games after this loss. Then they acted like the win at Auburn in 2003 was a monumental victory, calling them “one of the best teams in the country”. The Tigers went 9-4 in 2002 and would finish 8-5 in 2003, infamously resulting in Tommy Tuberville nearly being replaced by Bobby Petrino. The documentary ignored the Trojans’ last loss before the streak, which was in Berkeley against a similar team. Winning 34 in a row and 45 of 46 doesn’t really need to be embellished, does it? So why completely ignore the one loss in those 46 games? 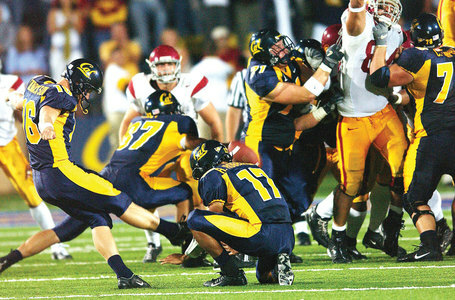 Cal’s Tyler Fredrickson kicks the winning field goal in overtime against USC in 2003. I guess it was to avoid mentioning the three-team race at the end of that year. No mention was made of the fact that Oklahoma was the unanimous #1 going into the conference championships (which of course the Pac-10 didn’t have) or that the Trojans finished third in the BCS standings behind the eventual winners of the BCS LSU. I did note that at one point Matt Leinart used the singular when referring to the USC national championship, although the narrator repeatedly talked about how the Trojans were a minute away from winning a third in a row. USC did beat Michigan at the end of that year, but when the team you’re playing is just playing for a nice bowl win, that’s not the same as actually playing a team who’s also trying to win a national championship. The famous “Bush push” to win against Notre Dame. Apart from the last-second controversial win over Notre Dame, the documentary also acted like USC was untouchable in 2005. A lot of mention was made of how many yards the Trojans (Reggie Bush in particular) put up against Fresno St. in the second-to-last game of the regular season, but somehow the fact that they gave up 42 points and only beat the Bulldogs by 8 wasn’t mentioned at all. You would have guessed from the information provided that USC won by several touchdowns. The point being that there were some cracks in the façade. USC was not seen as unbeatable by any sports fan I remember talking to that year, and I talked to a lot more people about sports back then. They were in 2004 by some but not in 2005. It was similar to the difference between the perception of the 2013 Florida St. team and the 2014 edition. They were still expected to win every game during the regular season, but they weren’t seen as invincible. I remember going to Louisiana for Christmas in 2005 and people asked me how close USC would make it, implying Texas was going to win and the only question was the margin. Of course, I insisted USC was in fact a very good team even though I picked Texas myself. Vince Young scores the winning touchdown against USC, ending the Trojan’s 34-game winning streak and giving Texas its only national championship since 1970. I know that’s an indication of regional bias, but there were people in other areas who saw USC as vulnerable. Based on the Notre Dame performance, there were also some Midwesterners (and Notre Dame fans from other regions) who saw the same thing. Anyway, I had a lot of respect for Pete Carroll even going back to the Patriots and I still do. I wanted him to lose once USC became a prominent team in 2003, but when I cheered for other teams to beat him I knew they were facing a prepared and formidable opponent. It just bothers me not to correctly characterize what actually went on, and not just trying to bolster a simplistic cardinal-and-gold-tinted recollection of events. I’m not even saying this as a USC detractor. Why not give Carroll some credit for not being a bad coach (though I guess you could say he was mediocre) in the NFL? Why not give the 2002 team credit for only losing a couple of early games to good teams (the other was to Kansas St., who would finish 11-2) and then finishing strong? According to Jeff Sagarin, that was the best team in the country that year despite the losses. I thought they at least had the best second half of the season. I understand you can always highlight some things and not other things to tell the story a certain way, but don’t pick a game that’s a bad example of what you’re talking about and distort what happened and who the other team was. One thing I was glad they didn’t do was mention whether Vince Young’s knee was down in the second quarter. I think the ball was already coming loose from his hands when the knee touched (if we were evaluating a fumble rather than a lateral, I don’t think it would even be very controversial); but even if he were down, he already had a first down on the play. Texas would have had first and goal at the 10. The game was decided by who did (or didn’t do) what in the fourth quarter, not by that call. I just think getting it right is more important than telling a dramatized story, which was compelling enough on its own in reality. Not too much to say this week. Alabama did a good job controlling the game against what I believe is a good Wisconsin team. Baylor and TCU didn’t do such great jobs against SMU and Minnesota, respectively. Baylor’s defense did not seem like that of a title contender, and TCU didn’t put the Gophers away until the clock ran out. Everyone else in the top 14 just stayed where they were. I did move Boise down a couple of spots after being shut out in the second half against Washington. The Broncos could have probably scored at least 30 by the middle of the third quarter, but instead they almost allowed the game to go into overtime. Texas A&M impressed me late, and Auburn looked better than I thought they would. Auburn could definitely be dangerous later in the year when the offense settles in a little better. Georgia had an impressive margin of victory in only 50 minutes of play, but they only moved up because of Boise and Arizona St. moving down. I could have put Wisconsin below Missouri, but I don’t think the Tigers would have done any better. Oklahoma St. had a dubious performance, but it was on the road, and maybe Central Michigan isn’t so bad. We’ll see. 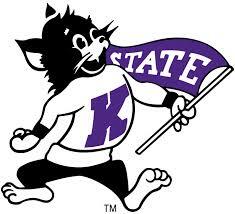 Kansas St. wasn’t playing a good team even by FCS standards, but they won in a shutout, and it was 24-0 at halftime. I can’t find any fault there. As I mentioned in preseason, they were one of the strong considerations I had for the top 25 that just narrowly missed. The coming week may be even more uneventful, although there are some potential revenge games to highlight. LSU (who as I mentioned didn’t end up playing in opening week) will go on the road against Mississippi St., and Oregon visits Michigan St. Also, Boise St. travels to BYU (which won on a Hail Mary to spoil Mike Riley’s debut at Nebraska), and Oklahoma travels to Tennessee. I considered the Vols for the rankings above, but giving up 30 to Bowling Green was too much of a cause for concern in my view. I didn’t do a post-game blog about LSU/A&M, but I updated the Rivalry Series entry, and I will write a bit about the Tigers in my second blog this week. I also plan to write about relative conference strength and lower bowl possibilities. I think the new committee rankings will be relevant to that discussion. What I’ll discuss below is the current state of my rankings and how I think that SHOULD translate into what the committee does with the major bowls at the end. I can’t speculate with any accuracy what they will do, especially being that I don’t know how the rankings for this week will look. Because Florida St. has been accumulating a reasonable amount of points while Alabama has recently had a bye and played Western Carolina, the Seminoles are still on top, although I would agree with probably most people in the conclusion that Alabama looks like the better team at the moment. Georgia has also thrown a wrench into things by beating Auburn, losing to Georgia Tech, and failing to win the East. If Alabama were playing a two-loss Georgia team next week and Florida St. were playing a three-loss team, Alabama would have a good chance to move back into #1, but unless the Yellowjackets beat Florida St., I don’t see that happening now. By the way, I’ve never experienced such a disappointing day of college football in my life. I watched about 10 games that went down the final couple of minutes, and every last one of them went the way I didn’t want them to. Georgia choking was just the beginning of a long day. Also, I don’t know why on Earth Auburn thought they could win with field goals. Alabama should have at least three losses, but then how would they torture me? One thing they did was allow LSU to move into first place in the SEC in total defense, so I guess we can say we got first place in something. Despite the SEC East’s troubles with the ACC (although let’s not forget Georgia beat Clemson earlier this year), I think it’s justified to have three SEC WEST teams in the top 10 and all seven in the top 40. By the way, the Mock BCS agrees with the latter assessment. Texas A&M got no points, but they were ranked in one of the formerly BCS computers, so I think that makes them #40. It merely has three SEC West teams in the top 11 instead of the top 10 though. Anyway, there are two more slots to fill out in the semifinals, so I’ll now talk about that. That last spot is going to be tricky. I do have Ohio St. there right now (actually ahead of Oregon at the moment), and I can’t imagine that if the Buckeyes beat Wisconsin, that either the formula or my mind will change. However, I do understand the argument that maybe losing to Virginia Tech at home could be a disqualifying factor. As I discussed last week, I firmly believe the best alternative to Ohio St. in that instance is TCU, whose only blemish is a 3-point loss to Baylor about 6 weeks ago. West Virginia is better than Virginia Tech, but they don’t belong anywhere near the top 25. The Mountaineers beat Baylor by a couple of touchdowns. Even if Oregon loses, I still don’t see Baylor being #4. The committee might pick them ahead of Arizona in that instance, but I don’t think I would. That might not seem to make sense being that I have Boise St. ahead of Arizona right now, but the Broncos have the better schedule at the moment. I know that’s hard to believe, but Boise St.’s opponents have a winning record overall, and Arizona’s opponents have a losing record overall. The Mountain West simply is not leaps and bounds behind the power conferences, and Boise played a very competitive schedule out of conference (while Arizona didn’t). However, Fresno St. isn’t going to help the Broncos very much. So with a win, Arizona should easily pass them up as well as TCU and Oregon (whom they would have to beat). I’m going to assume Alabama would be out of the running with a loss despite whatever strength of resume they might have. It might be possible for a team to be #1 going into championship week and hang on with a loss at some point, but this is not the year. I do want to acknowledge that Baylor may be much better than #14. They would close the gap considerably by beating Kansas St., but obviously Oregon would be a better win than Kansas St. Also, the Bears would not pass up TCU. So the only teams that should be in the running from my perspective are Nos. 1 to 5 and #7 Arizona. Arizona/Boise St. has prompted me to consider a slight modification to my system though. I have preliminary ratings of teams between 0 and about 7 (which would be if the team with the best schedule went undefeated, which is nearly impossible). Boise St. has only beaten one team (Colorado St.) with a preliminary rating higher than 4.0, while Arizona has beaten three (Oregon, Arizona St., and Utah). So my idea is to have those higher-rated opponents count for a bit more than they do already. This would be assuming that Georgia Tech, Wisconsin, Missouri, and Kansas St. all lost. I believe a win by any of those (although Kansas St. might be debatable) should get them in. I have the teams above so they would be eliminated from the bottom right now. If Baylor beats Kansas St., I would want them to be given a safe spot though. Boise St. should be assured the “group of five” spot with a win, but if they lose and Marshall wins, I would want them replaced with Marshall. If both lose, I guess Colorado St. would take that slot. I’m not waiting for the committee this time. It’s LSU/Alabama week, so I want to give my rankings and move on. I’m going to include the mock BCS standings as I calculate them. They will be the number in parentheses. There are no team logos below because there is only one “new” ranked team (Missouri, which replaces West Virginia), and they were ranked earlier this season. LSU/Alabama is just one of the big games before the Iron Bowl, but there is a good chance it will be an important game for the national title race once again. Once again, I’m going to have to ask for some patience in Ole Miss going down in the rankings. They have Presbyterian next week and a bye the week after that, so they’ll possibly fall several spots in that time. (LSU, for instance, fell three spots after taking off this past weekend alone. Marshall and Michigan St. fell much more.) The following week, the Rebels play Arkansas, so someone else could also pass them after that week as well. Why are they so high right now? Other than only having had one bye week, Ole Miss has the 4th-best schedule right now. The Rebels beat Alabama, which rates as the second-best win by any team this season right now. The best win is Mississippi St.’s win over Auburn. As you might guess, apart from Mississippi St., the best (or least-bad) team to lose to is Auburn. Anyway, if I were just making it up from scratch, Ole Miss would be somewhere around #10, so I’m going to go through the top 10 and explain why Ole Miss is higher than each team in my ratings at the moment. I’m not going to comment on every team’s prospect for moving ahead of Ole Miss, but the first two are particularly relevant. LSU isn’t one of the top few teams to lose to, but they’re much better than Arizona, which beat #5 Oregon. Oregon is very close to Ole Miss in points though, so I would expect them to easily pass up the Rebels with a win next week. #7 UCLA also has two losses (one of them to Utah), so they certainly don’t have a strong argument to be ahead of Ole Miss. #8 Arizona St. only has one loss, but when your best win is over USC, you don’t belong ahead of a team with Ole Miss’s résumé. #9 Nebraska is another one-loss team that just doesn’t have the wins to compete with Ole Miss right now. The Huskers did beat Miami (which is no Alabama), but the quality of wins decreases rapidly from there. #10 LSU needs another big win. They have Ole Miss (which counts for less than Alabama) and Wisconsin (which counts for less than Boise St.) but really not much after that. Kentucky and Florida don’t rate very highly due to their records, and it’s harder to have the same strength of schedule playing in the East, especially when neither team has played a good out-of-conference opponent yet. Ole Miss beat Texas A&M, for instance, which has a better record than either of LSU’s SEC East opponents and rates a good bit higher. The Aggies wouldn’t necessarily beat the Wildcats or Gators, but it makes sense that they have a higher rating right now. Ole Miss went from being ahead of Mississippi St. in my ratings to being 0.25 behind the Bulldogs in the last two weeks, it just so happens there weren’t many teams in between ready to move up. Rating-wise, they’re as close to Mississippi St. as they are to Colorado St. now. It’s just not translating from ratings to rankings yet. Along with the top teams of the Pac-12 (mentioned above), the top teams of the Big XII are moving up. Kansas St. plays TCU next week, so the winner will probably find itself well into the top 10. The Big XII doesn’t have that much depth in my formula though, so if it’s TCU, they’ll probably go down from there (Kansas, bye, Texas, Iowa St.). Kansas St. can still finish undefeated in the Big XII (they lost to Auburn out of conference) and still has WVU and Baylor to play, so I believe they would be the stronger candidate for the top 4 by winning out. Notre Dame finally has a chance to make a move by beating Arizona St. Louisville and USC (later this month) won’t be bad additions to the resume either. Everyone lower down lacks a great schedule at this point. I know this because there are no 3-loss teams in my top 25. Colorado St. has a better rating than Marshall or Boise St., but the Broncos (with two losses overall) hold the tie-breaker in the Mountain West, so picking the “best of the rest” team might be tricky. Like the TCU/KSU game, Ohio St. and Michigan St. should produce a team that can move up and do well. Unlike that game, both teams have competitive opponents coming up and neither has a bye week. If Nebraska keeps winning, that would help the winner of the Big Ten East even more down the road if they end up winning the Big Ten title game. Oklahoma would get a big boost by beating Baylor, but there is not much left for the Sooners points-wise after that. I don’t expect a big move upward by Clemson. Other than Florida St., the ACC Atlantic doesn’t have much to offer as far as potential points. Georgia Tech and a South Carolina team that will probably finish .500 are the best left on the purple and orange Tigers’ schedule. I certainly don’t see Florida St. losing twice, which Clemson would need to happen to make the ACC title game. Arizona can still influence things with game against Washington, Utah, and Arizona St. Making the Pac-12 title game certainly isn’t out of the question. It seems like apart from Colorado, anyone in the Pac-12 South can easily beat anyone else. I mentioned Baylor. The Bears still have Oklahoma and Kansas St. left, so they can still win the Big XII. Duke looks like a good-but-not-great divisional winner again. Lastly, no one wants to win the SEC East, it seems, but Missouri has a one-game advantage right now. The black and gold Tigers would lose the tie-breaker if it’s a two-way tie with the Bulldogs though. Texas A&M appears to be Missouri’s toughest test left, while Georgia still has to play Kentucky (on the road) and Auburn before closing the regular season with non-conference games. This has nothing to do with anything, but I get multiple hits every day from some guy who obviously has poor internet searching skills and wants to know about what Texas A&M did in 1965 (something about their only conference win), so I’m just going to paste that whole season. Houston wasn’t in the SWC yet, so I guess it was Rice. This penalty took the potential winning points off the board for the Irish. I’ve updated the LSU/Kentucky rivalry blog if you haven’t seen it. I’ve been adding basic information to these and mentioning more in-depth observations in other blogs. Games that aren’t close will get less mention in the narrative. I also have one for Ole Miss of course. I also had a bit of fun at TigerDroppings. I literally gave myself a headache thinking about what to do and the future possibilities. I know I indicated that last week might be the last time I would alter the order of the first few teams for my rankings here, but unforeseen circumstances arose to change that. Tennessee is not a good team, but Ole Miss gained enough points last week to pass up Mississippi St. I was thinking Florida St. or Notre Dame (had they won) would be more likely challengers for #1, so I just didn’t think about this possibility. I said last week I don’t think Kentucky is a good enough team to beat Mississippi St. and in light of yesterday’s game, I even more strongly don’t think they are. I particularly don’t think the Bulldogs would lose such a game after a bye week. Florida St. has a bye next week, so there would have been less reason to keep Florida St. in the top spot had Mississippi St. topped my computer rankings. Also, if Florida St. had lost and I had to make a change anyway, that would have made it even easier. LSU had a better record and seemed to be the better team on paper when they went on the road to play Ole Miss last season. Sometimes rivalry games like this go the other way than people would expect. A possibly more fitting example: 2008 is arguably the worst LSU season since 1999, and the Tigers took Alabama, who was undefeated and ranked #1, to overtime when they played the Tide at home. Right now, Ole Miss has only played two SEC opponents that do not reside in the state of Tennessee, and as I mentioned, one of them was at home. The Rebels have not won a true road game outside of the SEC (and I they had a degree of home-field advantage against Boise St. in Atlanta). The only reason they’re #1 in my system right now is they’ve had one fewer bye week than their in-state rivals. Also, Alabama is the only team I have in the top 25 right now that they beat. That’s not enough for me. Why not make Mississippi St. #1 anyway? For one thing, I’m having to depart from the computer rankings anyway. The only reason to move Florida St. down would have been to just take all subjectivity and deference out of it. Why not keep a team who just beat another unbeaten team there for now? Florida St. also has by far the longest unbeaten streak at the moment. Another reason is I don’t like to make a change one week after another change without both teams losing. If Ole Miss does win next week, then it would have been a new #1 three weeks in a row. That’s the kind of thing that I’m trying to avoid. Also, Florida St. was not a new #1 for this season (and certainly not forever). That’s a higher standard for me, so waiting until they reclaim #1 in the computers seems reasonable. Mississippi St. will not have a big-points week until November 15 at the soonest (Alabama), so it’s possible someone else would be #1 if Ole Miss loses before that week anyway. Anyway, expect #1 next week to be from Mississippi (unless both Mississippi St. and Ole Miss lose), and expect that team to also be #1 here. I think it will be good to fully endorse my computer ratings at the same time that the playoff committee has to reveal their opinion for the first time. Outside of the top 3, the rest of the top 25 is completely unaltered from the order of highest points in my computer ratings. Marshall keeps moving up, but keep in mind that unlike in the polls, they can easily get passed up as the season goes on even if they stay undefeated. The problem is when teams have a chance to pass them up, those teams tend to lose (or in the case of Arizona they have bye weeks). It may understandably seem a bit strange that TCU is behind Minnesota. The Horned Frogs have had two bye weeks, which doesn’t help. Also, for obvious reasons, Baylor is a more harmful loss to TCU than TCU is a harmful loss to Minnesota. You might not take Colorado St. seriously, but for some reason the polls take USC seriously despite their loss to Boston College. Colorado St. beat Boston College and has only lost one game, to Boise St. (who is just outside of the top 25). I don’t understand why the polls love Oklahoma so much. Any other team that just had its second loss of the season (with no impressive wins) would be lucky to be in the top 25 at all. I would understand doing that for Alabama maybe, but not for a team that hasn’t won a national championship in 14 years. Kansas St., the second team to beat the Sooners, makes its first appearance in my top 25 since the end of the 2012 season. Virginia isn’t a bad team, so it might be nice if Duke got more credit for beating them, but the Cavaliers’ record needs to improve for the win to count for more. There are many more reminders of why this system needs to be put out of its misery than there are positives in the bowl match-ups, but there are four games I’m looking forward to. The only BCS game I’m even somewhat excited about is Kansas St. vs. Oregon (though the runaway offenses will probably become tiresome). Neither Texas/Texas A&M nor the Backyard Brawl worked out as bowl games. Oklahoma vs. Texas A&M should be a good substitute for the former though. That gets top billing in my mind for best non-BCS contest. The second and third choices are probably Georgia-Nebraska (CapitalOne [which you might remember as the Florida Citrus Bowl]) and LSU-Clemson (Chik-fil-A, aka Peach). But I’m still going to complain about LSU’s treatment shortly. A brief aside about the Cotton. Maybe it’s because I’m not Texan, but I really don’t understand why someone was going to veto Texas/Texas A&M. I get that Texas had its schedule set, and the non-conference schedule is also curtailed by the fact that the Big XII schedule is now 9 games, and they weren’t going to bend over backwards to accommodate a rival who decided to go to the SEC instead. But how is any of that a reason not to play that rival in a bowl game, especially one with such historic ties to both programs? Just for spite someone had to put a stop to it? I know the non-BCS bowls I mention all involve SEC teams, but the SEC has the best non-BCS teams. Clemson and Nebraska are two of the best non-champions. Nebraska would have easily been regular-season champions of a combined Big Ten (but got creamed by a Wisconsin team that didn’t even really belong in the title game), and Clemson tied in the ACC Atlantic (the one with the only ACC teams worth a whole lot) with Florida St. but lost the head-to-head tie-breaker. Oklahoma actually tied for the Big XII championship but didn’t get the Fiesta invite for losing head-to-head (not to mention out of conference to Notre Dame). I’m still annoyed that Northern Illinois was forced into a BCS game, but they still may be better than Louisville. I have never understood why they made it top 16 rather than top 12. Any undefeated team is almost guaranteed to be in the top 12, as will many strong one-loss non-major-conference teams. But Northern Illinois has played probably the easiest schedule in FBS. They’re in 2007 Hawaii vicinity with how bad it was, and we all remember how that turned out. And that was an undefeated Hawaii team. As mentioned, at least there is some solace in the fact that this system will be replaced. Not that NIU is sure to be embarrassed. If North Carolina St. can beat Florida St., why not the Huskies? I’ve already mentioned Wisconsin winning a game it didn’t belong in (and actually doing the embarrassing in the process). And Wisconsin is still an example of why you don’t put the wrong team in a match-up, they can always win. I’m not saying the Big Ten had a choice here (I understand the probations of both Ohio St. and Penn St.), but it just didn’t work out well for neutral fans here. It’s nice that LSU and two of the lesser Louisiana teams made bowl games, but I’m disappointed that Louisiana Tech isn’t one of them. All the weak bowl teams around, and they couldn’t find a place for a 9-win team with three respectable losses? The AD explained that they were hoping the Liberty Bowl (which he would later say misled him into believing there would be an invite regardless) would invite the team and had simply asked the Independence Bowl to await the outcome of other invitations. It seems that Oklahoma being in a non-BCS bowl trickled all the way down to Iowa St. getting the Liberty invite instead. (9 of the 10 Big XII teams got invites.) I know in hindsight this was a terribly unfortunate decision, but Louisiana Tech deserved better than playing in its own back yard against a local team, so I don’t blame him for thinking that was a strong possibility. I don’t think it was hostility for the potential opposition at all. I can almost assure you there is more excitement in that area for the average Ruston-West Monroe high school football game than there would have been for La. Tech vs. UL-Monroe, but it would have been better than nothing. Speaking of high school football, it would have been good for recruiting in the area for players and their families to be able to watch both teams at the same time. It also would have probably been a better business decision for the Independence Bowl. I doubt the Ohio Bobcat faithful will travel to Shreveport in droves, nor was that a team that needed to be secured with any urgency. It seems like they would want good will with a team that sometimes plays at Independence Stadium (including this year against Texas A&M) and will likely be a team of interest in the bowl in the future. I had said in comments elsewhere that the WAC had terrible bowl tie-ins, but now that I’ve read up on it, I guess the WAC didn’t have any bowl tie-ins. Furthermore, we may have seen the last down of WAC football, but I’ll get into the conference cluster**ck with my next blog. A few hours to the South, LSU’s placement in the Peach Bowl provoked a Rodney Dangerfield headline in the Baton Rouge Advocate. I’m also not happy LSU took what is supposed to be the sixth SEC slot with the Peach bowl (the fifth spot if there aren’t two SEC teams in BCS bowls). How many times will South Carolina go to the Outback Bowl? I thought they might want to mix it up for once. LSU vs. Michigan would have been a great match-up, and LSU hasn’t been to Tampa since 1988. I have read that LSU may have been preferred to Georgia by the CapitalOne Bowl, but the SEC insisted that as the runners-up Georgia should be given the spot. Funny that I don’t remember LSU receiving similar consideration when it ended up in the Peach Bowl after losing to Georgia in the SEC title game in 2005. Just like Georgia this year, that LSU team suffered only its second loss in the title game in question. Unlike Scott Rabalais (who wrote the article linked to above), I don’t begrudge the Cotton its pick of Texas A&M, but it doesn’t seem like someone was looking out for LSU like the SEC was looking out for Georgia, and someone should have been. LSU lost a bitterly close game to Alabama, as did Georgia, but LSU’s other loss was a respectable 8-point road loss to Florida. No comparison to a 35-7 humiliation at the hands of South Carolina. While of course Georgia’s big win was over Florida, that doesn’t trump LSU’s wins over South Carolina AND Texas A&M. I do understand that South Carolina shouldn’t have have to play Clemson again though, and I guess the Gator is a second-rate SEC bowl now, so they didn’t want to send South Carolina there either. Still, I think they could have put that logic aside especially considering that’s a good SEC venue, it’s the most convenient to South Carolina apart from the Chik-fil-A, and it’s not a step down in terms of opponent from the Outback (Michigan beat Northwestern in overtime to finish one game ahead in the Big Ten standings, but Northwestern was undefeated out of conference including a win over Vanderbilt, so the Wildcats have a better record). To go full circle back to what I mentioned early on here, Clemson is a better opponent than Northwestern or Michigan, so at least there’s that to be happy about if LSU wins. Also, this should be a game serious fans are interested in even though it’s not the flashiest bowl to be in. Anyway, good thing there aren’t so many early bowl games, because I don’t see much else worth getting out of bed to watch. I may get a head start on watching college basketball this year. I may even blog about it. Out of rankings: (21) Texas, (22) Rutgers, (25) Kent St. I know people aren’t going to be happy with this necessarily, but I really believe that at least the top 10 or so is exactly as it should be. Notre Dame has the best collection of wins, followed by Florida. If Florida simply hadn’t played Georgia and played out the rest of the season, they would be ahead of Ohio St. despite having played one fewer game. Also, if you were to give Florida a win over Alabama (while still leaving off the Georgia loss), there is a good chance the Gators would be ahead of Notre Dame. I do give Ohio St. a poor strength of schedule rating, but that doesn’t mean the Buckeyes were untested. They defeated a 10-win team, a 9-win team, and three 8-win teams. The only team in the top 8 of the Big Ten standings that the Buckeyes avoided playing was Northwestern. All but the most die-hard SEC supporters would not likely be complaining if the Buckeyes were not on probation and were set to play in the BCS championship game as the undefeated Big Ten champions. As to Florida being ahead of Alabama, I simply think Florida has the better collection of wins. Alabama—LSU, Georgia, Michigan, Mississippi St. When you go much further below the top 40, I don’t think that’s especially relevant for conversations about how to rank the top 5, but even if we cover the top 60, Alabama is still 4-1 while Florida improves all the way to 7-1. Also see my chart in last week’s (actually Friday’s) comments. I don’t regard Georgia as a worse loss than Texas A&M, but whether you do or not, I don’t think that overcomes the difference in quality wins. If you think the BCS should have a rule that only conference champions should be considered, then I think many would agree with my ratings that the best two conference champions are Alabama and Stanford. If independents are exceptions to this rule, then this would give you Alabama and Notre Dame, exactly what is going to happen. Kansas St. would take exception to being behind Stanford among champions, but the Wildcats didn’t beat anyone in my top 10 and only two teams in my top 40. Stanford does have two losses to one, but one of those losses was to Notre Dame, a team that happened to beat Oklahoma, Kansas St.’s best win by far. Stanford lost to a fairly mediocre Washington team, but there isn’t a big gap between Washington and Baylor. Stanford won six games against my top 40 to Kansas St.’s two. I purposely make wins and losses count a lot here, but it only goes so far. I can imagine some grumblings over South Carolina being ahead of LSU. LSU did beat the Gamecocks after all. There are a couple of very minor things that could have changed this. One would have been LSU scoring a couple more points or allowing a couple fewer points against the Gamecocks. While margin of victory is not generally a relevant factor for me, home teams have a historical advantage of around 3 points per game, and home teams win about 5% more often. Some compensate for this discrepancy by eliminating the point difference (this is done in ratings that include margin of victory of course, usually ones that have something to do with betting since it can be added or subtracted based on the location of a given game), and some compensate by uniformly counting home wins less and away wins more (and usually also home losses more and away losses less). Since I think the advantage is generally in close games, I do a bit of a hybrid. If a game is decided by three points or fewer (which is also useful because it so happens to be a field goal… often a couple more first downs during the course of a game would have given a team a field goal where in a drive where it ended up with no points or even a touchdown rather than a field goal) or in overtime (obviously, one more point on either side would have avoided overtime in the first place), I only give the home team 90% of the win (not 95% because I don’t give it 5% of a loss), and I penalize the away team 10% less (not 5% because I don’t give it 5% of a win). So while LSU has slightly better wins and a better second loss (both lost to Florida; Alabama is regarded as slightly better than LSU), it doesn’t show up that way. Lessening South Carolina’s penalty for losing to LSU makes the LSU loss seem to be a better loss than Alabama. Another way LSU ends up ahead would have been if Washington had not blown an 18-point fourth-quarter lead and lost to Washington St. in overtime. Maybe the bowl games will sort out this discrepancy anyway. There may also be some unhappiness over Oklahoma staying ahead of Texas A&M, but this is another very close call. Texas A&M lost to my #3 and #9 while Oklahoma lost to my #1 and #7. As to the wins, while #4 is obviously a much better win than #28, don’t forget that Texas A&M played two fewer games against AQ-level opponents and one more game against an FCS opponent. While the proper order of the teams beyond this point is not the objective of my ratings and I do not necessarily endorse this order, it does make some sense. If there were a 25-team playoff (god forbid), they would all have good arguments for inclusion. San Jose St. does seem unusually high, but they were second for a conference championship behind Utah St. In this conference, Louisiana Tech finished 3rd even though the Bulldogs only fell a two-point conversion short of taking Texas A&M to overtime. San Jose St. itself only lost at Stanford by 3 points. San Jose St. may not beat Clemson or Florida St. on a neutral field, but I don’t think many expected them to win 10 games regardless of the opposition. As to Utah St. (San Jose St.’s other loss), the Aggies only lost to Wisconsin (Big Ten champions) by 2 points and to BYU (which San Jose St. beat) by 3 points. I would also note that BYU lost at Notre Dame by only 3 points. Oregon St. beat Wisconsin and BYU (despite going on to lose three games overall), so it makes sense that the Beavers are ahead of the Aggies. Florida St. won the ACC. They beat Clemson but had the worse conference loss, to North Carolina St., so they’re a very small distance behind the Tigers. Northern Illinois won the MAC championship with only a single loss all season (to Iowa), and Boise St. was the best team in the three-way tie atop the Mountain West (with Fresno St. and San Diego St., both of whom finished just out of the top 25). Boise St. also lost to a mediocre Big Ten team in Michigan St., so this is another reminder to give Ohio St. a bit of credit. Louisville of course wrapped up the Big East and won 10 games this season. Northwestern and Michigan were also good enough against quality competition to make the top 25. Michigan of course played Ohio St. in inter-division play and Notre Dame and Alabama out of conference, so this helped make up for having one fewer win than Northwestern does, but still the Wildcats have a slight edge. Ball St. has won six straight since losing to both MAC-title contestants in back-to-back weeks and the Cardinals’ only other loss was to Clemson. The Cardinals beat Indiana and South Florida. Granted, those aren’t great AQ opponents, but the AQ performance looks a lot better than that by either Northern Illinois or Kent St. (which lost to Kentucky). More impressive than that, they also defeated Toledo (which lost to Arizona in overtime and beat Cincinnati) to end the Rockets’ 8-game winning streak. Arkansas St. won the Sun Belt and hasn’t lost since September. Along with the one in-conference slip-up against Western Kentucky, the Red Wolves’ only other losses were to Nebraska and Oregon. Alabama, Florida, Kansas St., northern illinois, Northwestern, Notre Dame, Ohio St.
I’ve already covered the BCS title contestants here, so I’ll start with the better 2-loss teams. Stanford benefited from its win over Oregon and passed up Georgia, LSU, and Nebraska. Ole Miss isn’t a bad win this year, but it wasn’t quite enough to put LSU ahead of Georgia, which defeated Georgia Southern. Minnesota isn’t a bad win either, so Nebraska (which will likely play Wisconsin for the Big Ten championship) is still close to LSU. 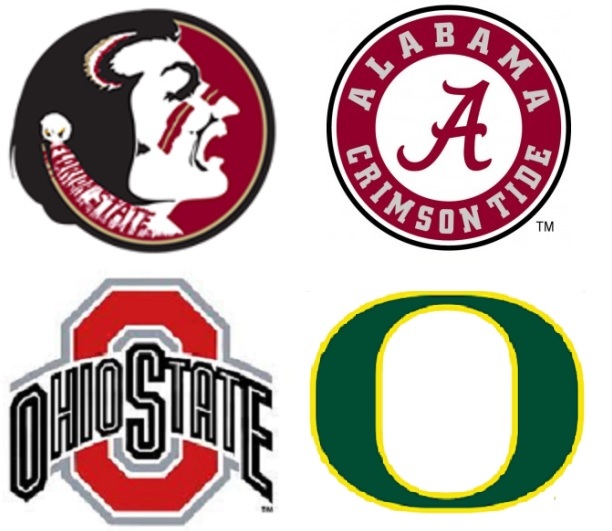 The winner of Clemson/South Carolina may be a threat to one or more of these teams. 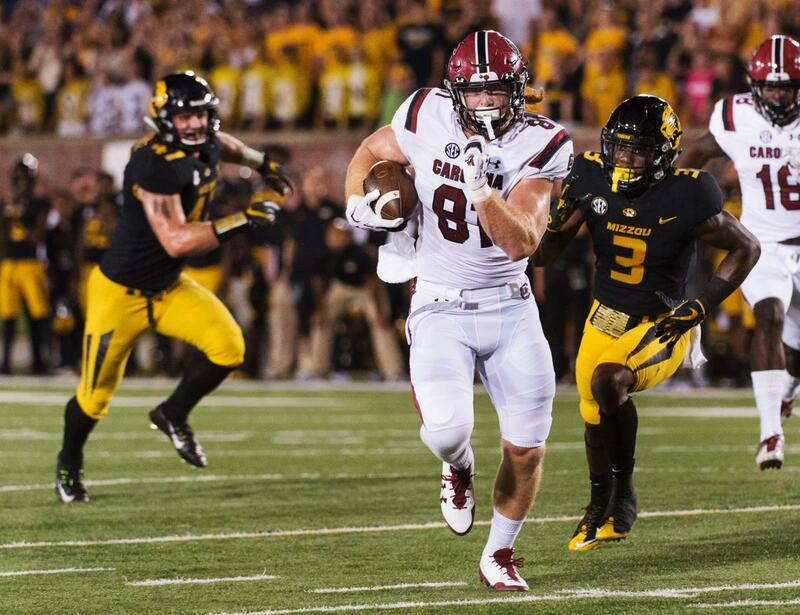 Texas A&M isn’t likely to gain much by beating Missouri. Florida St. is still on the periphery of national-title conversation, and the Seminoles have a chance to leap some teams by beating Florida. Oregon St. has a chance to be the spoilers against Oregon, which would put Stanford in the Pac-12 title game and a rematch with UCLA, which is also Stanford’s opponent this weekend. The Beavers could move up a few spots as well. The winner of Bedlam should pass up some teams. Oklahoma St. is #26. As expected, Oklahoma passed up Texas in the Longhorns’ bye week. Rutgers, which beat Cincinnati to move up a few spots, should stay ahead of Texas by winning and may pass up losers of other games. Most of the bottom was fairly steady. San Jose St. got some credit for beating BYU. Utah St. won the big WAC game of the year, while Northern Illinois won a major conference game over Toledo in the MAC. It’s sad that beating USC doesn’t do UCLA more good. I almost feel sorry for the Trojans. That loss to Cal is still a big negative for UCLA to contend with. Northwestern recovered from losing to Michigan in the previous week by beating Michigan St. Not a great win, but there was enough movement by other teams to give the Wildcats an opening. Michigan still theoretically has a chance to win the Big Ten.